When I travel to a new place, I always make sure I visit some local markets to get a feeling of the local life (when I’m lucky enough to find a non-touristy market) and sometimes to grab a bite. Who am I trying to trick? I always grab a bite at local markets! Anyway, there are a bunch of good street markets in Amsterdam where you can not only find delicious Dutch foods but also get to see a little more of the local culture. In this post, I’ll talk about all sorts of markets. Flower, cheese, flea, food, etc. I’m pretty sure you will find one to your taste (pun intended). At the end of this post, you’ll find a map with all the locations mentioned below. The name is self-explanatory, but I’ll give you a tip: at Foodhallen, you’ll find the most mouthwatering food you could dream of! Seriously, there is a whole range of vendors selling food from all over the world, not only Dutch snacks. By the way, I said street markets but this one is actually indoor. The Foodhallen is special because they sell a range of high-end street food. The first indoor food market in Amsterdam has an amazing concept with over 20 street food stalls. So, big variety, nice vibes, live music…in other words, a must-see! Opening times: Sunday to Thursday from 11 am to 11:30 pm, Friday and Saturday from 11 am to 1 am. Here you can find anything you imagine. Fresh fruits and vegetables, fabrics, clothing, flowers, and some good. Oh, almost forgot! There are stalls that sell the traditional raw herring as well as freshly made stroopwafels. If you have no idea of what I’m talking about, read about the most traditional Dutch dishes here. Don’t forget to bring cash with you. By the way, the Albert Cuyp is the largest street market in Europe. Opening times: Monday to Saturday from 9 am to 5 pm. At the Sunday Market, you can find fashion accessories, clothes, design items, art, handmade products, food, and toys. The atmosphere is excellent and you’ll notice this market is pretty different from the IJ-Hallen market I’ll mention below. The Sunday Market is pretty alternative, but it doesn’t have all that old stuff from flea markets. Oh, no! Things here are handmade and the place looks fairly organized. Opening times: The first Sunday of the month, from 12 pm to 6 pm. Europe’s largest flea market has around 500 stalls of goods, antiques, worn clothes and shoes, toys, canvases, literally everything. Just like the Foodhallen, the IJ-Hallen is also an indoor market, but here they charge the entrance, €5 for adults and €2 for kids. The market is inside a big warehouse in Amsterdam North. To get there, you have to take the free ferry behind the Central Station towards NDSM. Pro tip: for “better” things get there early, for cheaper things, go on Sunday afternoon. Opening times: In the IJ-Hallen website you can check the agenda. The Netherlands’ symbol is, among others, a tulip. Rightly so, because 50% of exported flower bouquets come from here. Besides, one of the world’s largest flower gardens is also here, the colorful Keukenhof Gardens. Stroll along this vibrant and romantic floating market (The stalls stand on houseboats) right in the heart of Amsterdam. 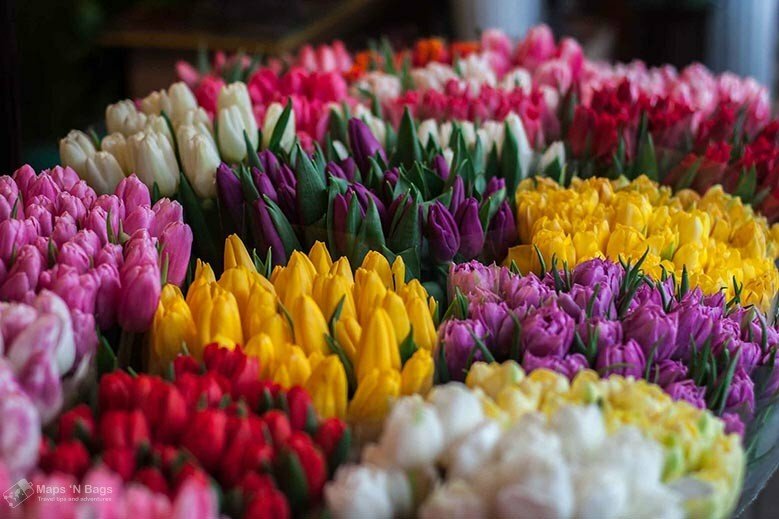 Here you can buy a bulb, a single flower, or the whole bouquet. Don’t worry, the bulbs are ready to export, so you can easily take them home with you. If you don’t feel like buying a bulb, or your country’s laws don’t allow it, check out their other souvenirs. They sell wooden tulips, clogs, and other Dutch symbols. Ps: During winter you will only see Christmas Trees, of course. Opening times: Monday to Saturday from 9 am to 5:30 pm, and Sunday from 11:30 am to 5:30 pm. Perhaps one of my favorites in this list. The Pure Market is mainly about food and entertainment, such as live music. This is a good place to try not only different cuisines but also some Dutch Gouda cheese. Or maybe an organic beer? Organic what?! Yes, they have a whole range of healthy and delicious products to try and gifts to bring back home. Opening times: Every 2nd Sunday of the month from 11 am to 6 pm (except November, January, February, and March). Full of good food and vintage stalls, the Noordermarkt is located in the hip neighborhood Jordaan. But that’s not all, you can also find jewelry, flowers, carpets, and movies. Opening times: Monday from 9 am to 1 pm and Saturday from 9 am to 4 pm. Around 25 booksellers from all over the country come here to sell their books. In the Spui Book Market, you will find antique and second hands books, old prints, posters, periodicals, and pamphlets in Dutch, English, French, and German. Browse around this old-fashioned market which has been functioning for over 25 years. Opening times: Friday from 10 am to 6 pm. The Nieuwmakt Market has at least one stall almost every day. However, it really comes to life on the weekends when the farmer’s market happen here. Well, as I said, it’s a farmer’s market so you should expect to see a bunch of stalls selling fresh fruits and vegetables, flowers. Opening times: Every Saturday from 9 am to 5 pm. Amsterdam’s oldest market hosts stalls which sell books, second-hand goods and clothes, souvenirs, vintage decoration, and food. Literally everything. Most part of it is good stuff, but you’ll also find some touristy crap. The Waterlooplein Flea Market is much more focused on locals than on tourists though. I only found Dutch books when I went there, for example. 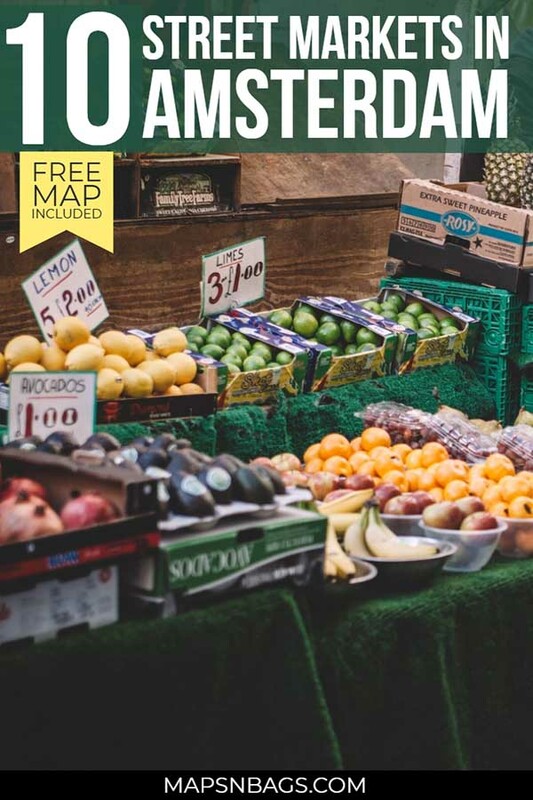 If you want to have a local feeling in a street market in Amsterdam, this is the place! Opening times: Monday to Saturday from 9:30 am to 6 pm. 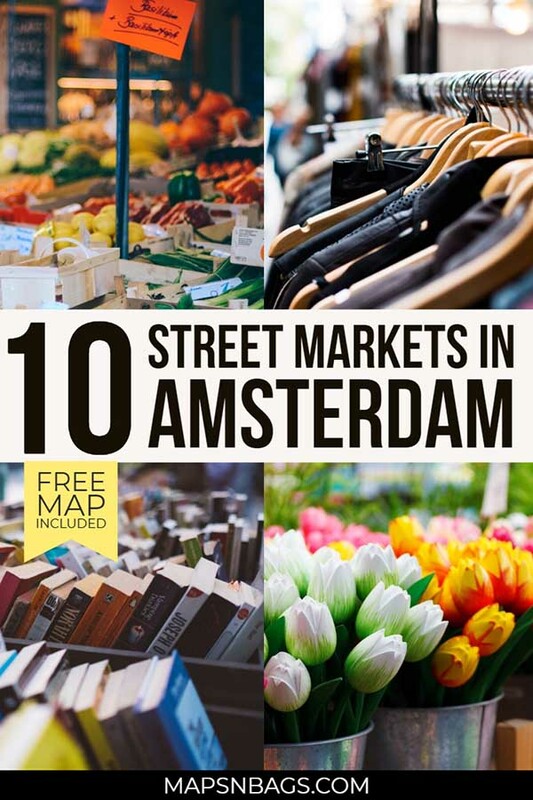 So, which market are you going to visit in Amsterdam? Would you add another market to this list? Drop your suggestion in the comments below! This entry was posted in Netherlands and tagged Amsterdam, Things to do.